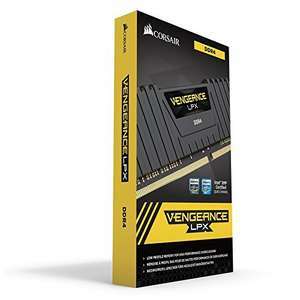 was searching for ram and came across this its about £17 cheap than what i paid for the white versions on amazon.fr (shipped today) bit unlucky. True, I'm surprised how expensive ram has become. but its a decent price at this moment in time. Good deal! Should save anyone having to buy RAM right now about £25. Doubt it will in increase but more likely drop and be more volitile with more price spikes. Plus with more 3d nand fabs online the demand for those wafers should lessen and allow more capacity for sram. That only applies to multi purpose fabs though. What is insane is the way the dram suppliers have screwed everyone over for a profit. As long as demand outstrips supply the price will continue to increase. For those that need Ram right now, they have to pay the market value, whether they like it or not. The manufacturers have been quite happy to let the prices rise and their profits with it. Their agreement to not compete or have a price war meant they avoided undercutting each other and prices have gone through the roof. So have their profits. Now though the shortage is such that it is letting other ram suppliers cut in on what Samsung sees as their market share, hence the sudden move to increase supply. They are also concerned that Chinese suppliers will enter the market and want to have supply meet demand before that happens. While Samsung started making changes in October we aren't likely to benefit from them until the second half of 2018. That is assuming demand doesn't continue to increase due to mobiles and such. Oh, and we've got to hope they decide to actually start competing on price. Doubt it will in increase but more likely drop and be more volitile with …Doubt it will in increase but more likely drop and be more volitile with more price spikes.Plus with more 3d nand fabs online the demand for those wafers should lessen and allow more capacity for sram. That only applies to multi purpose fabs though. overpriced ram with flimsy heatsinks and you can't even overclock them. Bought a pair of new vengeance sticks while back and sent them straight back after trying them out. overpriced ram with flimsy heatsinks and you can't even overclock them. …overpriced ram with flimsy heatsinks and you can't even overclock them. Bought a pair of new vengeance sticks while back and sent them straight back after trying them out. Low profile(necessary for a lot of people with large aftermarket air coolers), 3000Mhz sticks. They're entirely decent and there's nothing 'overpriced' about them compared to normal pricing at the moment. What is insane is the way the dram suppliers have screwed everyone over …What is insane is the way the dram suppliers have screwed everyone over for a profit.As long as demand outstrips supply the price will continue to increase.For those that need Ram right now, they have to pay the market value, whether they like it or not.The manufacturers have been quite happy to let the prices rise and their profits with it. Their agreement to not compete or have a price war meant they avoided undercutting each other and prices have gone through the roof. So have their profits.Now though the shortage is such that it is letting other ram suppliers cut in on what Samsung sees as their market share, hence the sudden move to increase supply. They are also concerned that Chinese suppliers will enter the market and want to have supply meet demand before that happens.While Samsung started making changes in October we aren't likely to benefit from them until the second half of 2018. That is assuming demand doesn't continue to increase due to mobiles and such. Oh, and we've got to hope they decide to actually start competing on price. Up to €192.90 now... Should've pulled the trigger earlier when I had the chance! Up to €192.90 now... Should've pulled the trigger earlier when I had the c …Up to €192.90 now... Should've pulled the trigger earlier when I had the chance! Could've sworn I checked the rest of them last night and they were all around €200. Not the end of the world though, got 8GB of Adata 2800/CL17 memory that'll do for now, but 16GB of 3000/CL15 will be mine one day!